Credit card rates for new consumer accounts rose yet again in the last two weeks, hitting 16.85%, the highest level in the Credit Card Monitor since IndexCreditCards.com began tracking rates in 2005. The rate is up from the last survey's result of 16.81% and roughly 2 percentage points above the average last summer when rates were still under 15%. The most recent increase was due to a rise in average reward credit card rates, which jumped to 17.46% from 17.39% in the last two weeks. The average rate for non-reward consumer credit cards stayed at 15.43%. IndexCreditCards.com includes only the standard rates offered on new credit card accounts, not teaser introductory rates. Rising rates are in line with what many industry observers predicted would happen with enactment of new federal credit card regulations. Under the Credit CARD Act provisions that went into effect in February of this year, credit card companies can't increase interest rates on new accounts during the first year or on existing balances. Hampered by those restrictions, issuers are bumping up credit card rates on new accounts to make up for lost revenue and pricing flexibility. Average rates offered on new student accounts, meanwhile, dropped by more than a tenth of one percentage point to 16.27% from 16.38%. It's unclear how student credit card rates are responding to new rules that require adult co-signers for students under 21 and heavily restrict credit card marketing to college students: the average student credit card rate has bounced up and and down slightly since the provisions went into effect in February. Average business credit card rates, meanwhile, remained the same since May. The average rate for business credit cards is 13.75% for non-reward accounts and 15.74% for reward credit cards. Business credit cards are not subject to the same consumer protections provided by the Credit CARD Act, and they are unlikely to have those protections extended to them by law. A recent Federal Reserve report concluded that extending the protections wouldn't be worth the risks of higher interest rates and tighter credit in the small-business credit card market. However, both Bank of America and American Express say they will voluntarily offer business credit card customers key consumer protections, such as no rate increases on existing balances and at least 45 days' notice for rate increases on future purchases. 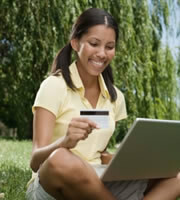 Many credit card offers feature tiered rates, which are set according to consumers' credit ratings. Those with excellent credit scores get the lowest rates, while consumers with poor credit are offered the highest rates. To determine a single "average" rate, IndexCreditCards.com includes all the various rate tiers that card issuers offer. Some rate tiers vary by as much as 10 percentage points for the same credit cards, and the highest rates for some new accounts top 20%. Consumers with excellent credit scores now can get rates 4 to 5 percentage points lower than the overall market average. The average consumer rate for excellent credit is 10.86% for non-reward cards versus 15.43% for the overall market, and 13.68% for reward cards versus 17.46% for the overall reward credit card market. Financial institutions represented in the survey include American Express credit cards, Bank of America, Capital One, Chase, Citi, Discover, HSBC, PNC/National City, Iberia Bank, Simmons National Bank, U.S. Bank, Wells Fargo, and more. 0 Responses to "Credit Card Rates Step Up Again"